You may think by the title of this post that I’m talking about Blue Jays, or perhaps squirrels, but that’s obviously not the subject of the photo above. No, the title refers to a couple of visitors we had to our feeders yesterday, a species we hadn’t seen around our house since the fall, and even then the ones we saw weren’t stopping to hang around. 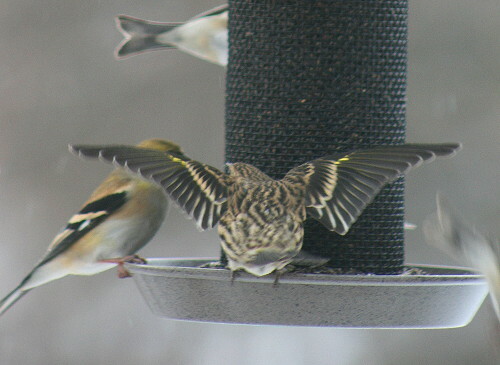 There were just two of them at the nyger feeders, chowing down with a large flock of American Goldfinches. Can you pick her out in the photo above? Here’s a better look at the culprit, a little brown streaky bird that comfortably falls into the “little brown job” category. 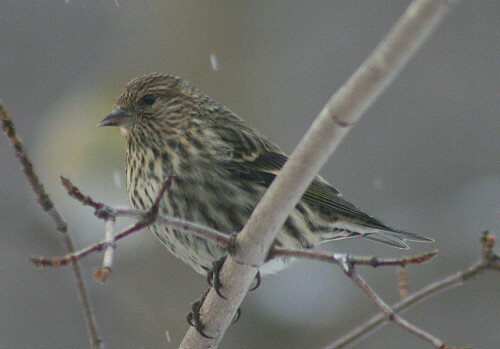 Pine Siskins are a type of finch that breeds in coniferous forests through most of Ontario, but more abundantly in the north (reflecting the relative abundance of their preferred habitat). They feed on the seeds of conifers, particularly White Spruce, White Cedar and Eastern Hemlock, and in years where these species produce low crops in the north the birds will irrupt south where they are frequently seen at feeders. 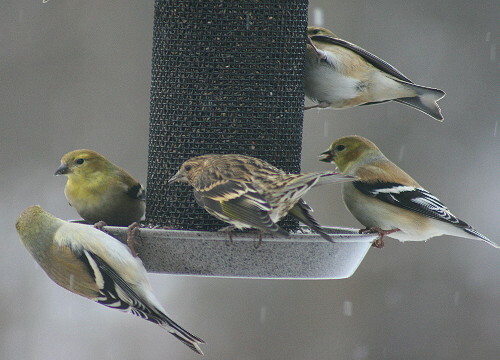 They’ll often hang out at the nyger feeders with goldfinches, House and Purple finches, and redpolls, although depending on the number of perches you have in your feeder assortment usually the flocks don’t intermingle too much. Population levels are hard to monitor because of the tendency of individuals to wander in response to variable food availability – one year the big crops will be over here, the next they’ll be in this other spot, and so counts at any given spot will fluctuate greatly. This is true of both winter and summer populations, since there’s no point in raising a brood in an area where there’s no food. Pooling Christmas Bird Count results from Canada and the US since 1950 show no real long-term trend in populations. However, they do show huge variation in abundance from one year to the next, almost biennially. It’s an interesting graph; you can dial up more CBC results here. 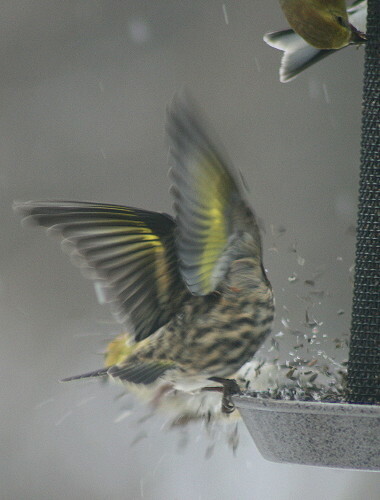 The siskins would throw out their wings and extend their heads to snap at the neighbouring goldfinches. Goldfinches squabble among themselves a fair bit, but usually aren’t all that forceful about it. They’ll stand up to each other, snap back and forth, before one finally gives in. They all respected the siskins, however. Okay, okay! Don’t hurt me! The seed’s all yours! Often departing rapidly. Check out the yellow in the wings. Hey, shove over, punk! You’re in my personal space! Your mama had chicken legs! Finally. Room to eat in peace. Silly bully. All the energy she spent in chasing could have been spent in chowing. Love those action shots though . . . her yellow bits under her wings are lovely. 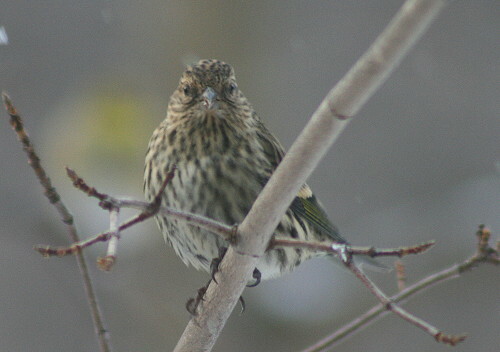 We don’t get Pine Siskins at my feeders but I’ve seen them in the mountains at my mom’s feeders. 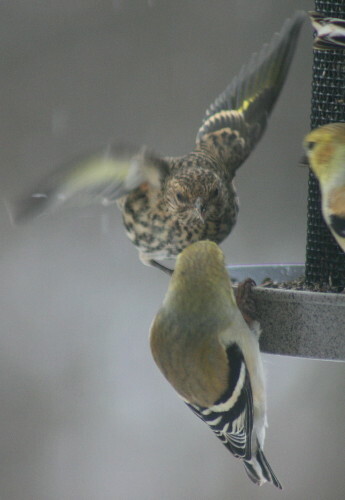 Pine Siskins aren’t on my life list yet. If I remember to look for a pint-sized female Red-winged Blackbird with a caffeine headache and blonde highlights, maybe I’ll score one. Terrific photo essay! 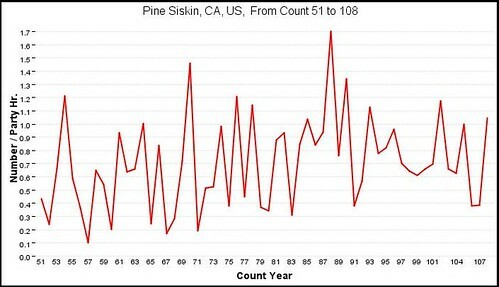 Interesting, too, to note the fluctuations in populations for any given area. 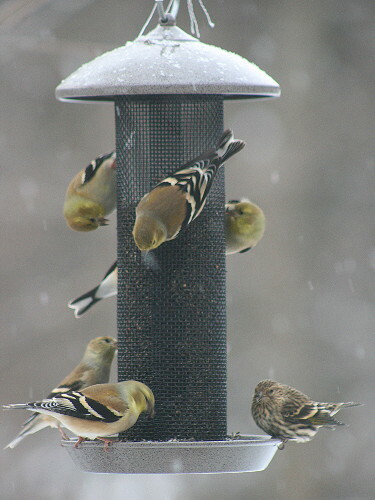 It’s funny how defensive the little finches get, Liza Lee, not just the siskins but the goldfinches too, and how really if they all just crammed in together and ignored each other they would conserve so much more energy. I can see being bullyish if it’s a limited food source, but birdfeeders are rarely so. Keep your eyes open, Lavenderbay! This is a ‘down’ year for them, but they’re certainly still around. 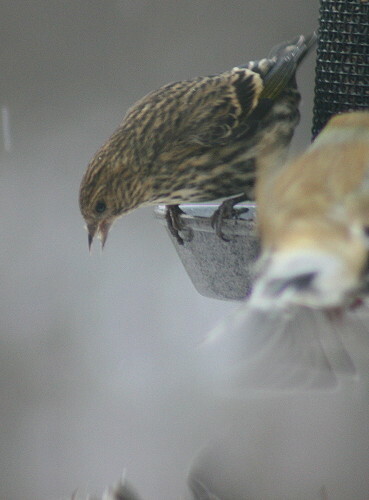 This is definitely an irruption year for the Pine Siskins. They first arrived at our feeder here in southeast Ohio 2 weekends ago, and this is the first time we’ve had them since I started counting birds 4 years ago. Life bird for me! (more at http://heather-heatherofthehills.blogspot.com/2009/01/plume-zoom-4-answers-revealed-and-life.html). 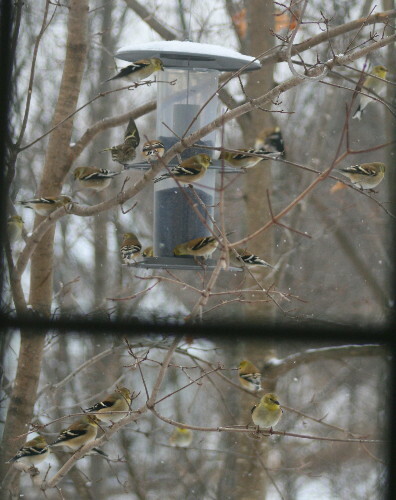 I haven’t found them to be any more aggressive than the Goldfinches, but that might be because there is constantly squabbling going on at the one thistle feeder that we have, regardless of whether it’s Goldfinches, Siskins, or both.